The recorded history of our parish really begins with the arrival of the Anglo Norman John de Courcey, ‘the conqueror of Ulster’. De Courcy first came to Ireland in 1177 at the behest of Henry II who had been encouraged by Pope Hadrian IV in 1155 in his Bull, Laudabiliter, to make Ireland an English fiefdom. (Pope Hadrian, Nicholas Breakspeare was the only English Pope) De Courcey’s actions eventually stretched the English Pale as far as Dunluce on the North Coast. Although an adventurer and a warrior he was also very devout. It is recorded that whenever he achieved victory in battle or success in affairs he would give the credit and thanksgiving to God. He was responsible for founding three Benedictine Abbeys in Downpatrick, a Dominican Abbey at Carlingford, Abbeys at Nendrum, and also a Benedictine Abbey named locally as St Andres or Black Abbey near Inishargy founded in 1218. There is no trace left of Black Abbey other than the name of the town land and a road. It was said there was a tunnel to link Black abbey and Grey Abbey which were about a mile apart. The village of Greyabbey named after the monastery, now in ruins, lies in the Northern end of our parish. The Grey Abbey was founded in 1193 by Aifreca (Affreca), wife of John de Courcy. She was the daughter of Godred II, King of Man (1153-1187) and sister of Reginald, King of Man (1187-1226). The traditional story goes that Aifreca, caught in a storm at sea when journeying from Man to the North of Ireland, vowed to erect such a foundation if she came safely to shore. She dedicated the Abbey to Our Lady de Leigh, de Jugo Dei. (Iugum Dei, “Yoke of God”). She brought monks from the Cistercian Abbey of Holm Cultram in Cumberland to create a community in Greyabbey. The Cistercians had first arrived Ireland in 1142 at the invitation of St Malachy establishing a foundation at Mellifont in Co Meath. Cistercians, aimed at a hidden and silent life, living by the simple rule of St Benedict. The monasteries were to be in remote places and the monks were to be self-supporting through working the monastic lands themselves, hence a sizeable estate was needed as well as fresh water. The monks of Greyabbey are thought to have operated fish traps on the shallow shores of Strangford Lough just outside the grounds of the monastery. Life was austere and silent, devoted to prayer and work. Community prayer was distributed over seven periods each day, beginning at 2 am, and consisted of the chanting of the Divine Office (psalms and readings); there was also the Conventual (community) Mass. In 1222 Ralph, Abbot of Greyabbey was made Abbot of Holm Cultram in and in 1237 Abbot John received the same promotion. The last abbot of Greyabbey was John Cassells. The design of the monastery followed the general principles governing all Cistercian Abbeys. The Church on the North side of an open square, around which the accommodation and work rooms and Chapter rooms were arranged. Along one side was a cloistered walking area. Much of this layout can still be deciphered from a visit to the well maintained ruins. 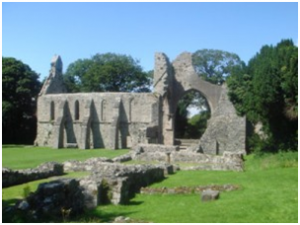 In 1306 the possessions or lands attached to the abbey were valued for taxation purposes at £35 6s 8d. Sometime between 1315-18, it is thought the abbey was almost completely destroyed during the invasion of Ulster by Edward Bruce. In 1536 in the dissolution of the monasteries, King Henry VIII who coveted the wealth of the monasteries for his own treasury, decreed, under the guise of reform, that all with an annual income of less than £200 were to be suppressed. In 1539 all surviving greater monasteries were dissolved. Although Greyabbey was not thought to have been a prosperous foundation it wasn’t dissolved until 1541. Monastic lands, administered through the Court of Augmentations, largely fell into the hands of the aristocracy and gentry. The abbey was later physically destroyed during military operations in the Elizabethan era. In 1572, Sir Brian O’Neill burnt it to prevent it being of use to English colonists trying to settle in the Ards Peninsula. In 1607 at the time of the Ulster Plantation the district was granted to the Montgomery family. In 1626 they re-roofed the Church and it served as a parish Church until 1778 when it was finally abandoned. Despite its numerous devastations and having been scavenged for stones for buildings elsewhere the ruins are still impressive and speak of a substantial foundation. There remain some interesting details, in particular a defaced figure in a niche on the Gospel side of the altar. It is an image of Aifreca, the one, all those centuries ago, who promised this place to the glory of God and whose remains lie within its peaceful grounds. The Abbey was transferred to the state in 1908 and is now in the care of the Northern Ireland Heritage Service department of the D.O.E. When de Courcy first came to Ireland he brought with him 22 Knights, among whom was William le Suavage (Savage). After de Courcey’s conquest of Ulster it was le Suavage who in 1180 built a strong castle on a drumlin on the eastern side of Strangford Lough west of the present junction of the Rowreagh and Loughdoo roads, the place known as Ardkeen. In the Irish Ard-Caoin means ‘a pleasant height’. (known locally as Castle Hill). It was the site of an ancient Celtic rath and had been inhabited for thousands of years. 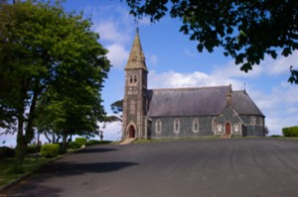 It is thought that followers of St Patrick were responsible for the ancient church on the side of the hill upon which ruins it is thought William le Suavage built a Church dedicated to St Mary. It is mentioned in the taxation of Pope Nicholas on 26 May 1204. Like the Monastery further North along the shore at Greyabbey, this Church was in use for more than two centuries during which years le Savage and his descendants held Castle Hill against the native forces. Following the English Reformation St Mary’s Ardkeen became a place of worship of the established Church. It is presumed that those who wished to remain faithful to the Catholic Faith were obliged to go elsewhere. In 1621 it is recorded that the Church was in ruins. It is unclear whether that was as a result of the weather or political unrest. In 1761 it was sufficiently restored for the Church of Ireland to hold a service there for the first in almost a century. Its exposed location however necessitated continuous repairs to the roof and eventually the congregation abandoned it in favour of the new Christ Church, located a few miles away in the town land of the Quarter near Kirkistown in 1847. It has been recorded that in the year 1703 a Fr Richard McTeggart “stood at the Mass rock in Ballycran.” The following year, 1704, (in which the Church of Ireland, St Andrews, Balligan was erected) the “Act of Registration of Popish Clergy” was passed. Among those registered at Downpatrick was the same Fr Richard McTeggart aged 44 and residing at Lisbane, close to the Salt Water Brig where the Blackstaff River meets Lough Cuan. He registered himself as “Parish Priest of Ardkeen.” He then had a “Mass House” built at Lisbane, which like its sister house in Ballyphilip, was a low mud-walled building, roofed with thatch. The Parish Priest of Ballyphilip, was Fr Patrick O’Prey who had been ordained by Bishop Oliver Plunkett in 1671. When Fr O’Prey died in 1717 he was not replaced on account of the harsh laws and times and so the entire Ards peninsula was under the pastoral care of Fr McTeggart who was based at Lisbane but travelled the whole area. As the century progressed the Penal Laws were not enforced quite so harshly. Fr James McTeggart who had been a curate in the Ards from 1735, was made parish priest in 1754. From his base at Lisbane, he also travelled throughout the peninsula. He was instrumental in having a church built at Ballygalget in 1760 while in 1762 he had the old “Mass House” in Ballyphilip replaced by the present church. As P.P. of the Ards he would have celebrated Mass in these buildings as well as at Lisbane and other places, even as far as Newtownards. By the time Fr Daniel O’Doran became P.P. in 1768 conditions would allow the building of a new permanent church at Lisbane. This was completed in 1777 and dedicated to St. Patrick. The story has been told of how the fine statue of St. Patrick, which still embellishes the sanctuary, was brought from Scotland to Ballywalter and then by horse and cart to Lisbane. In 1780 Fr O’Doran was appointed to Kilcoo. He was the last Parish Priest of the entire peninsula as it was in this same year that the parish of Ballyphilip was restored. Fr John Fitzsimons who had been curate to Fr O’Doran since 1777 was appointed Parish Priest of Ballyphilip in 1780 and Fr James Killen became P.P. of Ardkeen. Over the next 80 years there was a succession of Parish Priests based at Lisbane. When Fr John MacAuley was appointed in 1866, the population was getting too large for Lisbane so a new church was contemplated. Eventually in, 1876 the church of Mount St Joseph’s was opened. (It is interesting to note that Fr MacAuley ministered during the reign of Pope Pius lX, one of the longest ruling Popes and the one who initiated the first Vatican Council of 1869). 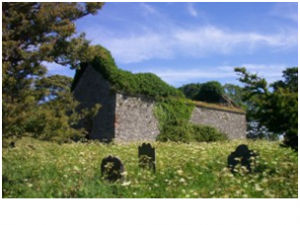 Lisbane Church was only used then as a mortuary chapel for funerals of those to be buried in the adjoining graveyard. It came to be that Mass was celebrated only on All Souls Day. There would have been six masses celebrated consecutively commencing at 6.30am on that day, three by each of the two priests of the parish. The building deteriorated over time, so a full restoration was undertaken by Fr. Arthur Haughey P.P. in 1966 with the help of volunteer parishioners. Its official use is now limited to one Mass on All Souls Day each year, 229 years after it was first opened. ST. MARY STAR OF THE SEA, NUNSQUARTER. As the 19th Century progressed the Catholic population of the Ards increased. More and more parishioners travelled from Kircubbin, Inishargy, Greyabbey, Killyvolgan, etc., to the parish church of St Patrick’s, Lisbane. A store house behind the present Blaney’s chemist shop in Kircubbin was brought into use as a temporary chapel. This building was owned by Captain Herron who had the Herron Hall built. In 1840 James Allen of Nunsquarter House, Allen’s Brae, offered a site for a new church to the Parish Priest, Fr Bernard Dorrian. Soon after this Fr Dorrian was moved to Lisburn and there was a succession of three more Parish Priests until Fr James Crickard was appointed in 1852. He took up the offer of the site in the townland of Nunsquarter and had a church built by 1864. Surely it is more than mere coincidence that ancient Christian links have been maintained here. Tradition tells us that the nuns, who had a house in this Quarter townland, were all slain in Cromwellian times (mid 17th century) and the little stream nearby ran red with their blood. Thus the present-day name of the stream is the Bloody Burn, the latter word reminding us of the influence of the Scottish settlers. The new Church was dedicated on 6th January 1865 to St Mary, Star of the Sea, by the Bishop, Dr Denvir who was a Downpatrick man. The site for the church was subject to a rent of 12 shillings per year which soon lapsed. In the following year, 1866, the Bishop drew up new boundary lines and created a number of new parish entities throughout the Diocese. One of these was the Slans/Ballygalget section of the Parish of Ardkeen which got its own Parish Priest, Fr John McCourt, in that year. 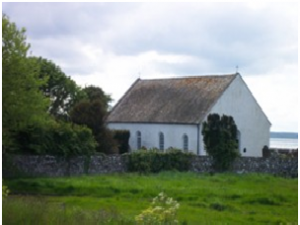 Fr John McAuley was made Parish Priest of the now reduced Parish of Ardkeen with the parish church still at Lisbane. It was not until 1910 that the adjoining Parochial House and the hall with stables underneath, were built under the supervision of Fr Nolan P.P. This land had also belonged to the Allen Family. In June 1974 a sectarian-motivated bomb attack demolished part of the church. However this proved a blessing in disguise as it provided the opportunity to make necessary improvements and extensions to provide for a still increasing population as well as post-Vatican II innovations. The major highlights of the latter part of the 20th Century were the celebration of Mass by a native of the parish, the newly ordained Fr John Brown CSSp in 1980, followed by the celebration of Mass by another former parishioner, the newly ordained Fr Eamon Fitzgerald, O.M.I. in July 1981. The actual ordination to the priesthood on 1st July 1990 of Sean Dillon from Killyvolgan, another native of the parish, took place in St. Mary’s. Fr. Dillon was ordained in St Mary Star of the Sea by Most Rev. Cahal Daly, Bishop of Down & Connor. On 19th June 1988 St Mary’s saw the Thanksgiving Mass for the Golden Jubilee of the ordination of Parish Priest Canon Joseph Conway, while on 7th July 1999, the church was the venue for a Mass of Thanksgiving for the Silver Jubilee of the ordination of Fr Jim Sheppard curate in the parish. In recent years the church at Nunsquarter has often been referred to as Our Lady, Star of the Sea. The retirement of Fr Jim Sheppard in 2005, due to ill health, coupled with reduced numbers of priests in the Diocese, has meant that no priest is resident at Nunsquarter and the Parish is administered by just one priest now, in the year 2006. The present parish of Ardkeen, dating from 1866, stretches from the edge of Mountstewart Estate, on the northern side of Greyabbey, to Ardkeen corner at the junction of Rureagh Road and Loughdoo Road, on the way to Portaferry; and from Ballywalter round the Irish Sea coast as far as Cloughey. The present church at Lisbane had been in use for almost a century and was now too small for the population. There was a need for a larger church, for schools and for a priest’s residence. 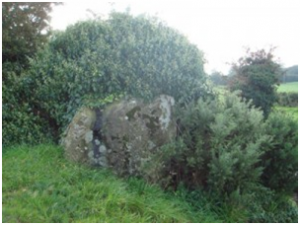 The Parish Priest, Fr John MacAuley, considered a site close to the church of Lisbane but eventually opted for a position in Ballycranbeg within sight of the ancient Mass Rock. The land was obtained from Harris estates on a lease of 999 years for an annual rent of £7-15-0. Fr MacAuley went to America to raise funds for the project succeeding in raising £900. The foundation stone was laid on 17th April 1874 and the new church was dedicated to St Joseph on 8th October 1876 by Most Rev Dr Dorrian, Bishop of Down and Connor. It is recorded that a special train was put on from Belfast to Newtownards where a large number of horse-drawn cabs were waiting to convey the people to Ballycran. The organist from St. Patrick’s Belfast presided at the harmonium. The collection, which amounted to more than £800 was taken up by a large selection of distinguished clergy, an MP, a solicitor, a vet and many more were needed as many of the congregation, which exceeded 1,000 people, could not get inside the church. Many had come to hear the famous orator, Fr Thomas Burke O.P. who preached the sermon. The school at Ballycran had been built two years earlier in 1874 (although it was later extended in 1917). This building was put into use to provide a meal after the opening of St Joseph’s for those who had travelled long distances to be there. The large Mission Cross was erected in 1878 and indulgenced by the Passionists during the Mission in June of that year. Bishop Dorrian was a great advocate of Parish Missions, often lasting two weeks and occurring in 3-year cycles. These would have been conducted by the Preaching Orders such as the Passionists and Redemptorists for the spiritual renewal of the parishioners. Fr Felix McKeating was appointed parish priest in 1881 (this was just two years after the apparition of Our Lady at Knock Co. Mayo). He undertook the building of the parochial house which was completed in 1883. On his death, two years later, he was buried “just outside the walls of the church”. The spot is believed to be close to the mission cross and beside where Fr Andy McGrattan , a native of the parish, was buried in 2000 A.D. Fr McGrattan, who was born in Ballyeasborough, had celebrated his first Mass in Mount St. Joseph’s in June 1950. Hugh Joseph Quinn, later to be ordained Fr. Salvator O.F.M. Capuchin was also a native of the Parish, having been born near the Lisbane and Ardkeen townland boundary. His brother William was also ordained into the Franciscan order, taking the name Fr. Emmanuel. They were ordained just prior to Fr. McGrattan, in the late 1940s. At Christmas in 1894 a severe storm, some described it as a hurricane, hit these islands. The roof of St Joseph’s was blown off, the windows shattered, the interior destroyed and the bell tower seriously shaken. The parish priest at the time Fr. McKenna and his successor Fr. Tully, made the necessary repairs. Fr. Nolan completed the restoration in 1910 installing a new Bell in the tower in 1911. Fr Neeson installed a generator in 1927 providing electric light for the church and school. Mains electricity was supplied in 1951. Following the second Vatican Council (1962 – 65), Fr Arthur Haughey was Parish Priest. Like his colleagues in the clergy he was given the task of implementing some innovations viz changing the use of Latin in the Mass to English, removing the altar rails which were felt to be a barrier between people and the altar and facing the congregation when celebrating the Mass which involved putting a new Altar in place. During Canon Conway’s time as parish priest a major refurbishment was undertaken, with the sanctuary being redesigned. The church was closed for a time and the nearby school was used to celebrate Mass. The re-opening and dedication took place on 5th April 1992.
Who, with their Saviour, would repose. The open doorway beckons: closer, closer yet. Peace, prefect peace, the Spirit does enfold. Before the altar I bend the knee. To thank you, I know not how to begin. Of selfish, clouding, crowding thought. My soul, be still, contentment be thy lot. Whereon thy humanity, divinity, both are knit. Sculpted, depicted, white and clear. You will heal me, so unworthy, so feeble. But support one another with love, in your name. Help me banish distraction, help me yield to your love. To our little bit of Heaven, Mount St Joseph’s, Ballycran.